My husband and I have been fortunate enough to go on a couple of cruises. We absolutely love cruises. Our 2 favorite cruises have one thing in common...ice cream! Now the ice cream itself didn't necessarily make the cruises our favorites, but they sure didn't hurt. The first cruise we went on together was a Disney cruise in the Caribbean. It was amazing. We had a great time, but here is where the ice cream comes in. On Disney's private island they had soft serve cookie dough ice cream! Soft Serve! This ice cream wasn't just flavored like cookie dough, no it actually had chunks of cookie dough in it. I didn't even know that was possible with soft serve. It was probably the best cookie dough ice cream I have ever had. We pretty much camped out by the ice cream lady for a while, but sadly we had to leave the island and now it is just a very very fond memory in my head. Now our other favorite cruise was our recent cruise to Alaska on Holland America. Everything was wonderful on this cruise (don't even get me started on their amazing ceramic loungers), but one day we went to the ice cream counter (a daily/multiple times a day activity for us) and they didn't have cookies n cream ice cream that day. Cookies n cream ice cream is typically my favorite. I was slightly saddened, but decided to branch out. The fun flavor of the day was cinnamon. We decided to try it, and it has forever changed our life. Cinnamon ice cream in a waffle cone might be one of the most awesome things in life. For the next few days of the cruise we got at least one (notice the at least part) of those ice cream cones a day. On the second to last day of the cruise they decided to switch out their flavors again. We were devastated. By this time we were on a fist name basis with the ice cream guy. His name was Zaldy (very cool name). At the end of the day we gave him such a hard time about not having the cinnamon ice cream he said he would try and find some for the next day. Zaldy came through for us! We got the eat one last amazing cinnamon waffle cone before we had to go back to reality. 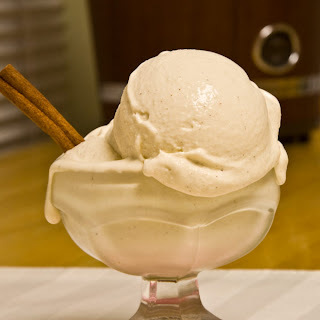 When I got home I just knew I had to search out and find a recipe for cinnamon ice cream. I tried a couple different recipes, but this one was by far my favorite and most similar to the wonderful ice cream on the cruise! Warm the milk, sugar, salt, cinnamon sticks and 1 cup (240ml) of the cream in a medium saucepan. When it comes to a boil, cover, remove from the heat and let steep at room temperature for 1 hour – mine steeped for almost 2 hours. Rewarm the cinnamon-infused milk mixture; pour the remaining 1 cup cream into a large bowl and set a mesh strainer on top. In a separate bowl, whisk together the egg yolks. Slowly pour the warm mixture into the yolks, whisking constantly, then scrape the warmed egg yolks back into the saucepan. Stir the mixture constantly over medium-low hear with a heatproof spatula, scraping the bottom as you stir, until the mixture thickens and coats the spatula – do not let it boil. Pour the custard through the strainer into the cream and discard the cinnamon sticks. Set aside to cool then refrigerate for at least 5 hours. *If you prefer to use honey as your sweetener of choice reduce to 1/2 cup honey. The honey does give it a slightly different taste but is still amazing. 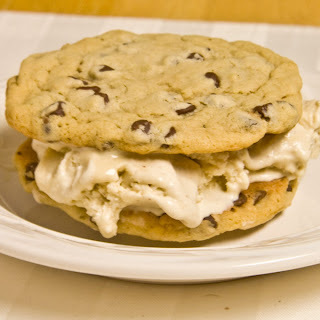 Here is another great way to eat this ice cream! I used my perfect chocolate chip cookie recipe and voila! Heaven! Cinnamon is definitely one of my favorite ice cream flavors, especially this time of year. I having been thinking about a Disney cruise for a while now, the soft serve story just sealed the deal. I love cinnamon ice cream! It looks so yummy in the ice cream sandwich too. I want a big scoop with some pumpkin bread! Great recipe! And I love the first yummy photo... super job. Cinnamon just so happens to be one of my favorite ice-cream flavors! Would it be a crime to, oh - I don't know... Swirl some pumpkin bread chunks into the ice-cream? I hope not! I usually gravitate towards coffee or chocolate myself, especially if they're together. I've never tried cinnamon, but it sounds like it would be perfect alongside some apple pie!